I was recently tasked with adding a CMS to an existing React application using GraphQL and Python+Django on the back end. Wagtail was a perfect fit for this task because it is simple to drop in as a Django app, and was easy to expose to our GraphQL layer. The ability to integrate Wagtail with our existing domain models at the GraphQL layer meant that we could leverage our existing API calls inside an article with little more than a ForeignKey and a small resolver. Follow Wagtail's Getting Started instructions. Add two new imports to your urls.py file. Add two new URLs to your urls.py file, just above the Wagtail entry. Access the wagtail admin at http://localhost:8000/admin/. 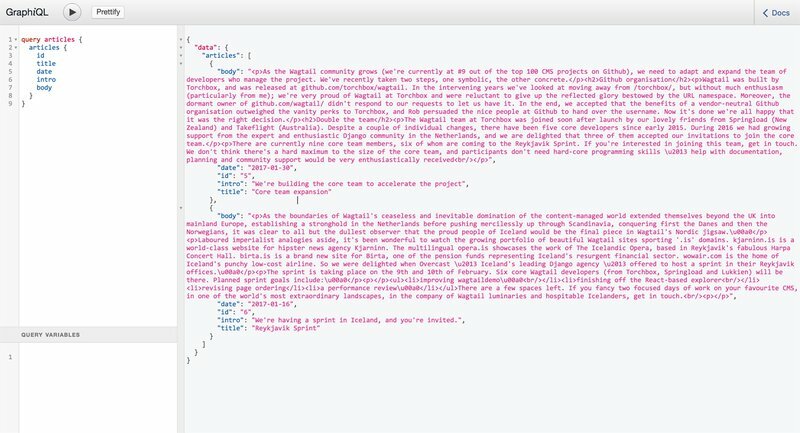 Editor's note: see Supporting StreamFields, Snippets and Images in a Wagtail GraphQL API for a continuation of this post.